At age 19, Savannah Vinsant finished seventh in trampoline at the London Olympics, the first American to reach the finals in the event. Any person who makes a career of athletic competition comes to terms with a life of ups and downs. But contrary to the typical equation, the ups were what initially troubled Savannah Vinsant about her chosen sport. "I actually was afraid of trampoline when I started," Vinsant said. "My coach kept working with me to try and get over my fears. I didn't want to jump real high." In school, Savannah Vinsant took a year off from trampoline to try to be a "normal" kid but found she was bored out of her mind. It's safe to say she got over any athletic acrophobia. Or perhaps more accurately, she rose above it. 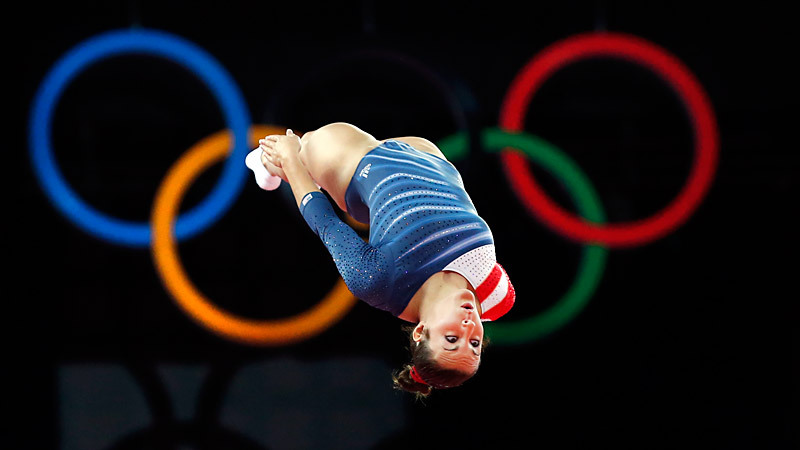 While the most celebrated result of the 2012 Olympics for USA Gymnastics was the ascension of the "Fierce Five" gold-medal quintet of Gabby Douglas, McKayla Maroney, Aly Raisman, Kyla Ross and Jordyn Wieber, Vinsant was a solo success story when she finished seventh in trampoline. 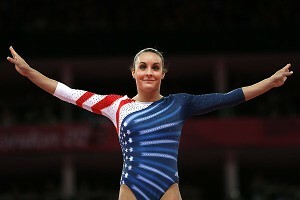 In so doing, she became the first American gymnast to reach an Olympic final in the event. Only a few weeks beyond her 19th birthday in London, she competed in a discipline in which one of her competitors had a daughter almost as old as Vinsant and in which the gold-, silver- and bronze-medal winners were 23, 26 and 30 years old, respectively. The Louisiana native reached the apex of her sport in a hurry. That isn't to say it was an easy trip. The first fork in the road came well before she had a driver's license. When Vinsant was all of 10 years old, Dmitri Poliaroush posed a simple question to some of the girls he coached at Trampoline and Tumbling Express in Lafayette, La. Did they want to go to the Olympics? Trampoline is one of four related disciplines in what are known as competitive rebound sports, along with tumbling, synchronized trampoline and double mini trampoline (vaguely similar to the vault). But only trampoline, in which judges score routines on both difficulty and execution, is part of the Olympic program, added before the 2000 Games. Prior to her coach's question, Vinsant competed in tumbling, double mini and trampoline. In fact, her earliest success was in tumbling, a discipline that came more naturally to her -- not to mention one that took place at slightly lower altitudes than the 25-plus feet trampolinists sometimes soar. How are you staying active this summer? 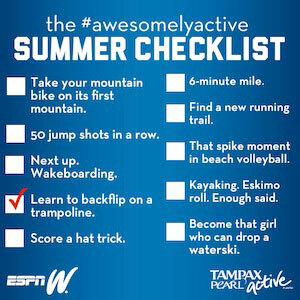 Click here and share with espnW on Pinterest. But only one offered a path to the biggest event in the world. So trampoline it was. Lafayette has a long history with trampoline. It hosted the sport's third world championship in 1966 and is home to Jeff Hennessy, who coached at what is now the University of Louisiana-Lafayette (formerly the University of Southwestern Louisiana) and with the national program that dominated the sport in the 1960s. That was the environment in which Vinsant learned the basics, but her family moved nearly 150 miles away to Newton, Texas, when she was 12 years old. Distance proved a trickier challenge than any early fear of the apparatus. Vinsant took a year off from competition and serious training to try, in her words, to be a normal kid. She found she was bored out of her mind. The family tried making the five-hour round trip three times a week so she could train in Lafayette. It even built a gym on its property where her mother could coach Vinsant. But just before her 16th birthday, she moved back to Lafayette to train on a full-time basis with Poliaroush and Tara Guidry. Her family stayed behind in Texas. "I'm going to be honest, I didn't have very many friends in high school," Vinsant said. "It was difficult because I just wanted to be a normal teenager in high school and have all these friends and everybody just love me. But at the same time, I realized that when I got out of school, none of that would even matter. I would become someone that I've wanted to become and I would fulfill my dreams if I just kept my mind set on the goal. That's pretty much what I did." It didn't come with a normal schedule. She graduated from high school in 2010. That same year she competed in events in Connecticut, Maryland and Virginia -- but also in France, Mexico and Singapore. That was the year she moved from junior to senior competition. Looking at the athletes in her group in the world championships in Metz, France, that fall, she saw people who had already competed in the Olympics. "I looked at my coach, and I was almost panicking -- big eyes and my heart started racing and I thought I was going to pass out before I competed because I was so nervous standing next to them," Vinsant said. "Where I'm at now, I can call these people my friends and take pictures with them and have conversations with them. "But my first meet I was scared to death to even talk to them." Less than two calendar years later, she not only earned her place among those competitors in London but also edged out many of them for a place in the final eight. Guidry contends that was just the beginning. With time to add difficulty to her routines, the coach said, a medal isn't out of the question in 2016. Like so many Olympic sports, trampoline recedes from the spotlight in the years between Games, but the athletes do not simply go into hibernation. A year removed from London and a long way from Rio in 2016, Vinsant's life remains hectic, to say the least. She is a student at South Louisiana Community College in Lafayette, taking classes with a focus in business management. A typical day sees her rise in time for an 8 a.m. class that runs nearly three hours. When that's over, it's off to her first training session for an hour and a half. After all of 30 minutes to change, relocate and potentially grab a snack, she's back in classes until 3:45 p.m. By 5:30 p.m., it's back to the gym for another couple of hours on the trampoline. The schedule rarely relents. Rio may be three years away, but November brings the world championships in Bulgaria. "You have so many talented kids that come through," Guidry said. "But to me, if you don't have it really in your heart and the passion and the love for the sport, you won't go as far as someone who really has the huge heart, the passion and the drive for it." The ups and downs turned out to be what Vinsant loved.